This post was inspired by overhearing a conversation at my local pub where they raved on about a local guy who knew where the ‘Blue Legs’ were at! He had bags of them for sale! I naturally assumed they meant ‘Blewits’. Only later I have realised ‘Blue Legs’ are a common name given to ‘Field Blewits’ which are much less common than our Wood Blewits in question, which has the common name of ‘Blue Cap’. Often I have seen people get them mixed up, so this makes you appreciate the relevance of scientific ‘latin’ names. The scientific names make sense overall (even though they tend to change and move around as scientific understanding evolves). Winter was making itself felt as it’s cold arm stretched across the land. But one lazy Sunday afternoon at the end of November, I dragged myself over to the local mushroom hangouts. Being south side of a major city you’re a little stuck for local woodland. Blaby on the other hand (South Leicester) comes up with the goods. We have a collection of mini public woodland and country byways. They’re all great because at one point or another they eventually end up at the local pub! Or is that my doing? Anyway. For a casual stroll, I was surprised to come across quite a few lovely specimens. Three of them I’m still not sure about and still checking. But today I came across a solitary ‘Wood Blewit’ (Clitocybe/Lepista nuda). You’ll maybe notice I have filed this post both under ‘Identity Crisis’ AND ‘Woodland Treats’ categories. All the identification characteristics were there: The colour, the presence of a wavy margin and also it being a stand alone species, living on dead organic matter (saprotrophs). When picking them you’ll notice the the woodland floor wants to come with them too! Another tell tale ID sign. As looks can be deceiving, be aware of mistaking it for one of the ‘Webcaps’. A spore print (see how here) can help solve this issue. See the pics below. I know they’re not of the best quality as I was bloody cold and didn’t have time to get the best results! In fact, the first time I had taken a spore print of the Blewit, I was very unconvinced about the pale pink (or pale lilac) colour that was to be expected. It seemed to look like a very light brown! (Note: See my other ‘snow covered’ post on the Wood Blewit). Hi there..I picked a mushroom that I cannot identify (I bought the pocket Collins book about mushrooms as a start to my foraging ventures – also not anything too similar in there). It looks very similar to this, although the cap is not really purple/violet, but more grey, however the stem has kind of purple streaks to it..It is similar size to this with gills etc..any ideas? Found it about a week ago in pretty short grass. Hi Baja. 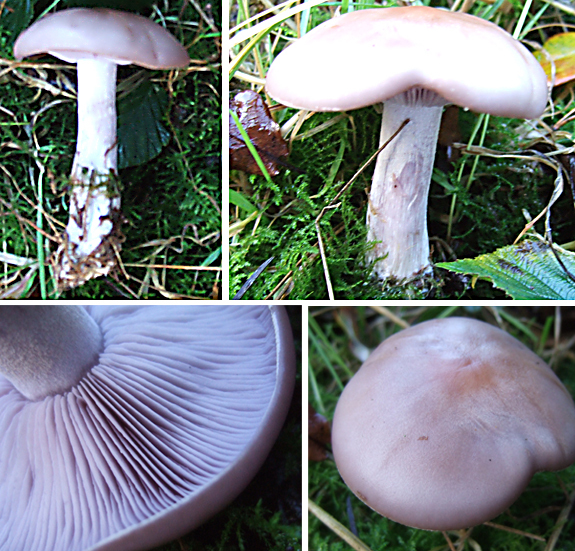 Wood Blewits tend to fade more brownish when they age and appear more paler if they are drying out, Similar to the top main image on this post. See what you think while examining your specimen. Hi Baja. Good to hear your having luck in finding some good mushrooms. Interesting tip on the Shaggy Pholiota. I haven’t tried to eat them, but it’s good to hear they can be made palatable. See my post on them here: https://www.mushroomdiary.co.uk/2011/09/shaggy-scalycap. I hadn’t heard about the reaction with alcohol. That’s me out then! Hi. I have been eating and finding what we call Blue legs for years and now I’m over 70 I still get them from one of our local lads in my local WMC. You talk about blewits, they are mostly in wood we call them wood blues. I was always told if there is Blue on it, eat it. You will only get them in winter and you can not cultivate them. As we speak I have about 5lb of them and I shall share them with my family – we love them. Good stuff. They are nice edible mushrooms. However, a Webcap (Cortinarius) lookalike can last through to early winter. They have the blue ting colouring too. But they are less frequent and have very dark rust brown spores.